My employer ZipRecruiter had a giant crisis at last month, of a scale that I have never seen at this company, and indeed, have never seen at any well-run company before. A great many of us, all the way up to the CTO, made a heroic effort for a month and got it sorted out. The nurses in the hospital told me they had everything under control, and they would take care of Toph while I went home, but I did not go. I wanted to be sure that Toph was fed immediately and that her diapers were changed timely. The nurses have other people to take care of, and there was no reason to make her wait to eat and sleep when I could be there tending to her. It was not as if I had something else to do that I felt was more important. So I stayed in the room with Toph until it was time for us to go home, feeding her and taking care of her and just being with her. It could have been a very stressful time, but I don't remember it that way. I remember it as a calm and happy time. Toph was in no real danger. The path forward was clear. I had my job, to help Toph get better, and I was able to do it undistracted. The hospital (Children's Hospital of Philadelphia) was wonderful, and gave me all the support I needed to do my job. When I got there they showed me the closet where the bedding was and the other closet where the snacks were and told me to help myself. They gave me the number to call at mealtimes to order meals to be sent up to my room. They had wi-fi so I could work quietly when Toph was asleep. Everything went smoothly, Toph got better, and we went home. This was something like that. It wasn't calm; it was alarming and disquieting. But not in an entirely bad way; it was also exciting and engaging. It was hard work, but it was work I enjoyed and that I felt was worth doing. I love working and programming and thinking about things, and doing that extra-intensely for a few weeks was fun. Stressful, but fun. And I was not alone. So many of the people I work with are so good at their jobs. I had all the support I needed. I could focus on my part of the work and feel confident that the other parts I was ignoring were being handled by competent and reasonable people who were at least as dedicated as I was. The higher-up management was coordinating things from the top, connecting technical and business concerns, and I felt secure that the overall design of the new system would make sense even if I couldn't always understand why. I didn't want to think about business concerns, I wanted someone else to do it for me and tell me what to do, and they did. Other teams working on different components that my components would interface with would deliver what they promised and it would work. And the other programmers in my group were outstanding. We were scattered all over the globe, but handed off tasks to one another without any mishaps. I would come into work in the morning and the guys in Europe would be getting ready to go to bed and would tell me what they were up to and the other east-coasters and I could help pick up where they left off. The earth turned and the west-coasters appeared and as the end of the day came I would tell them what I had done and they could continue with it. I am almost pathologically averse to belonging to groups. It makes me uncomfortable and even in groups that I have been associated with for years I feel out of place and like my membership is only provisional and temporary. I always want to go my own way and if everyone around me is going the same way I am suspicious and contrarian. When other people feel group loyalty I wonder what is wrong with them. The up-side of this is that I am more willing than most people to cross group boundaries. People in a close-knit community often read all the same books and know all the same techniques for solving problems. This means that when a problem comes along that one of them can't solve, none of the rest can solve it either. I am sometimes the person who can find the solution because I have spent time in a different tribe and I know different things. This is a role I enjoy. Higher-Order Perl exemplifies this. To write Higher-Order Perl I visited functional programming communities and tried to learn techniques that those communities understood that people outside those communities could use. Then I came back to the Perl community with the loot I had gathered. But it's not all good. I have sometimes been able to make my non-belonging work out well. But it is not a choice; it's the way I am made, and I can't control it. When I am asked to be part of a team, I immediately become wary and wonder what the scam is. I can be loyal to people personally, but I have hardly any group loyalty. Sometimes this can lead to ugly situations. But in fixing this crisis I felt proud to be part of the team. It is a really good team and I think it says something good about me that I can work well with the rest of them. And I felt proud to be part of this company, which is so functional, so well-run, so full of kind and talented people. Have I ever had this feeling before? If I have it was a long, long time ago. Well, I have done one thing you could never have done, and that is to have collaborated with Littlewood and Ramanujan on something like equal terms. Well, I was at ZipRecruiter during the great crisis of June 2018 and I was able to do my part and to collaborate with those people on equal terms, and that is something to be proud of. I don't have impostor syndrome about programming, advanced mathematics, or public speaking. I cheerfully stand up in rooms full of professional programmers and authoritatively tell them what I think they should do. 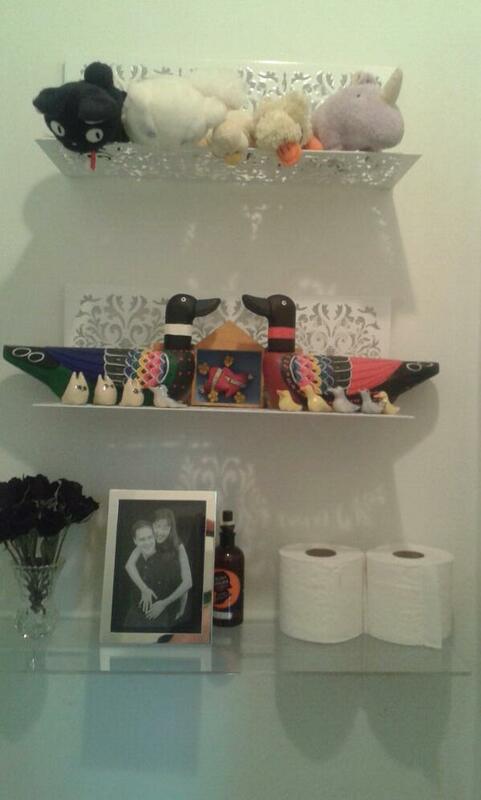 However, when I put up shelves in the bathroom back in May, I was a psychological mess. For every little thing that went wrong—and there were quite a lot—I got all stressed out and wondered why I dared to perform this task. The outcome was good, but I had a lot of stress getting there. I put in one plexiglass shelf, for which I had bought heavy-duty wall anchors in case the kids leaned on it, and two metal shelves higher up, which came with their own screws and anchors. The two upper shelves came with a paper template that I held up to the wall to mark where the holes should be drilled. What if the two shelves were slightly different and their templates were different and I needed to use both templates on the wall instead of using the same template twice? When I putting the heavy-duty wall anchors into the drywall, big divots of plaster fell out of the wall around the anchors. Then I filled in the holes with filler, and got filler in the screw holes in the wall anchors, and stressed about this. What if the filler in the sockets somehow prevented the screws from going into the anchors or caused some other unforeseeable problem? I didn't know how big to drill the holes for the smaller wall anchors and stressed about it, examining the wall anchor packaging for some hint. There was none. I wanted to insert the wall anchors into the holes with my rubber mallet. Where the hell is it? Then I stressed about using a claw hammer instead and maybe squishing the anchors, and spent a while looking for a piece of wood or something to soften the hammer blows. Eventually I gave up looking, wondering if I was dooming the project. I guessed how big to make the hole for the anchor, and was wrong; my hole was too small. I didn't realize this until I had the first anchor halfway in. Then I stressed that I might ruin it when I pulled it back out of the wall. Then I stressed about the size of the holes again when I drilled larger holes. What if I make the hole too big, and then have to fill all the holes and re-measure and re-drill the whole thing? The anchors didn't go into two of the holes. I needed to yank them back out, then redrill the holes, with the outer end a little messy, or the anchors wouldn't go all the way into the holes. Again I worried about spoiling the anchors. When I drilled the holes, sometimes the drill suddenly went all the way into the wall and the rotating chuck left a circular scar on the paint. Also, two of the holes didn't drill easily; I had to lean on the drill really hard to get it to go through. For a while I was concerned that there was some undrillable metal thing in the wall just where I wanted my hole, and I would have to fill in all the holes and remeasure and redrill the whole thing. Even though I had marked the wall for the lower shelf by holding the shelf against the wall and then poking a pencil through the actual holes, when time came to put the bolts in place, I found that the two holes were slightly too far apart. Somehow this worked itself out. On review, I see that several of these worries could have been completely avoided if I had had a supply of extra wall anchors. I knew enough to go to the store to buy wall anchors and screws for the bottom shelf, which did not come with its own hardware. There are a lot of different kinds of anchors, and I did not worry too much that I was getting the wrong thing. I was concerned (although not worried) that the screws holding the bottom shelf to the wall might stress the plastic too much and cause it to crack, either immediately or over time. Obvious solution: insert washers between the screw heads and the shelf. I went to the hardware store to get nylon washers; they didn't have any. So I got thin metal washers instead. I did not worry about this; I was sure (perhaps wrongly) that metal washers would do the job. When I asked the hardware people for plastic washers, they looked totally blank. “Plastic... washers?” they asked, as if this were a heretofore unimaginable combination. I could have felt like an idiot, but instead I felt, correctly I think, that they were idiots. For some reason, I was not even slightly worried about properly leveling the marks for the holes. I used a spirit level, which I consider pretty fancy. I was careful not to over-tighten the screws holding the plexiglass shelf in place, so as to avoid cracking them, but I was at no time afraid that I would somehow crack them anyway. Last weekend I was at a flea market and saw an HP-15C calculator for $10. 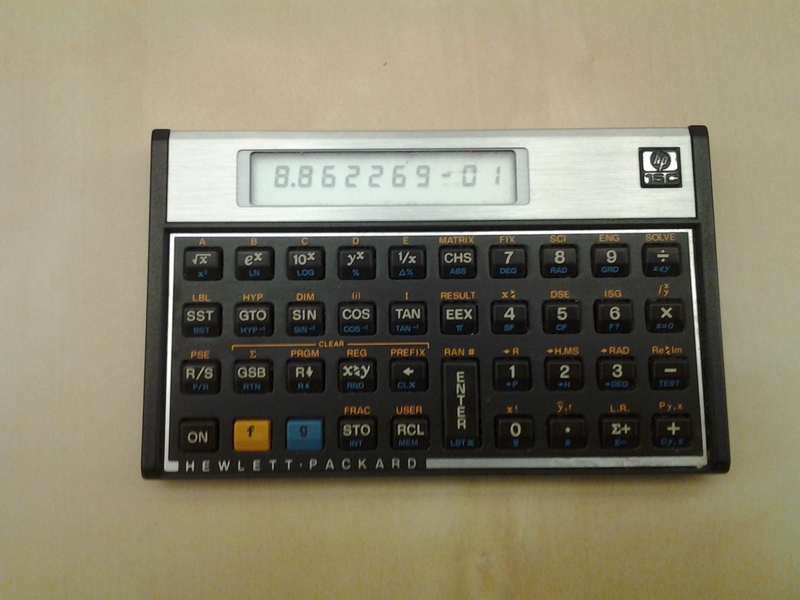 The HP-15C was the last pocket calculator I owned, some time before pocket calculators became ridiculous. It was a really nice calculator when I got it in 1986, one of my most prized possessions. I lost my original one somewhere along the way, and also the spare I had bought from a friend against the day when I lost the original, and I was glad to get another one, even though I didn't have any idea what I was going to do with it. My phone has a perfectly serviceable scientific calculator in it, a very HP-ish one called RealCalc. (It's nice, you should check it out.) The 15C was sufficiently popular that someone actually brought it back a couple of years ago, in a new and improved version, with the same interface but 21st-century technology, and I thought hard about getting one, but decided I couldn't justify spending that much money on something so useless, even if it was charming. Finding a cheap replacement was a delightful surprise. Then on Friday night I was sitting around thinking about which numbers n are such that !!10n^2+9!! a perfect square, and I couldn't think of any examples except for 0, 2, and 4. Normally I would just run and ask the computer, which would take about two minutes to write the program and one second to run it. But I was out in the courtyard, it was a really nice evening, my favorite time of the year, the fading light was beautiful, and I wasn't going to squander it by going inside to brute-force some number problem. But I did have the HP-15C in my pocket, and the HP-15C is programmable, by mid-1980s programmable calculator standards. That is to say, it is just barely programmable, but just barely is all you need to implement linear search for solutions of ! !10n^2+9 = m^2!!. So I wrote the program and discovered, to my surprise, that I still remember many of the fussy details of how to program an HP-15C. For example, the SST button single-steps through the listing, in program mode, but single-steps the execution in run mode. And instead of using the special test 5 to see if the x and y registers are equal you might as well subtract them and use the x=0 test; it uses the same amount of program memory and you won't have to flip the calculator over to remember what test 5 is. And the x2 and INT() operations are on the blue shift key. Saving two instructions might not seem like a big deal, but it takes the calculator a significant amount of time to execute two instructions. The original program takes 55.2 seconds to find n=80; with the shorter code, it takes only 49.2 seconds, a 10% improvement. And when your debugging tool can only display a single line of numeric operation codes, you really want to keep the program as simple as you can. Besides, stuff should be done right. That's why it's called "right". But I kind of wish I had that part of my brain back. Who knows what useful thing I would be able to remember if I wasn't wasting my precious few brain cells remembering that the back-step key ("BST") is on the blue shift, and that "42,21,12" is the code for "subroutine B starts here". and when I saw that !!38x^3!! in the denominator, I laughed, really loudly. My new neighbor was in her back yard, which adjoins the courtyard, and heard me, and said that if I was going to laugh like that I had to explain what was so funny. I said “Do you really want to know?” and she said yes, but I think she was mistaken. You know the idea that eventually we'll be able to download our brains/personalities to computer, to achieve physical immortality? There is a big trouble with this version of the immortality thing that people rarely mention. You go to the scanning and uploading center one day and write them a check. They scan and upload your brain, and say "All done, time to go home!" "That's it?" you say. "I don't feel any different." "Well, of course not. You're no different. But the uploaded version is immortal." Having a great time here in paradise! Haven't aged a day. Subject: Guess what I just did? Sorry to hear you're sick. Hope the chemo works out. Then you die, and some computer program somewhere simulates the immortal version of you having a little ritual observance to mark your passing. Sometimes the proponents of this scheme try to conceal this enormous drawback by suggesting that they obliterate the original version of you immediately after the upload. Consider carefully whether you believe this will improve the outcome. Human consciousness (which Jaynes describes and defines in considerable detail) is a relatively recent development, dating back at most only about 3,000 years or so. That is the shocking part of the theory. Most people probably imagine consciousness arising much, much earlier, perhaps before language. Jaynes disagrees. In his theory, language, and in particular its mediation of thought through the use of metaphors, is an essential prerequisite for consciousness. And his date for the development of consciousness means that human consciousness would postdate several other important developments, such as metalworking, large-scale agriculture, complex hierarchical social structures, and even writing. Jaynes thinks that the development of consciousness is a historical event and is attested to by written history. He tries to examine the historical record to find evidence not only of preconscious culture, but of the tremendous upheavals that both caused and were the result of the arrival of consciousness. If preconscious humans farmed, built temples and granaries, and kept records, they must have had some sort of organizing behavior that sufficed in place of consciousness. Jaynes believes that prior to the development of consciousness, humans had a very different mentality. When you or I need to make a decision, we construct a mental narrative, in which we imagine ourselves trying several courses of action, and attempt to predict the possible consequences. Jaynes claims that Bronze Age humans did not do this. What then? Instead, says Jaynes, the two halves of the brain were less well-integrated in preconscious humans than they are today. The preconscious mentality was "bicameral", with the two halves of the brain operating more independently, and sometimes at odds with each other. The left hemisphere, as today, was usually dominant. Faced with a difficult decision, preconscious human would wait, possibly undergoing (and perhaps even encouraging) an increasingly agitated physical state, until they heard the voice of a god directing them what to do. These hallucinated voices were generated by the right hemisphere of the brain, and projected internally into the left hemisphere. For example, when the Iliad says that the goddess Athena spoke to Achilles, and commanded and physically restrained him from killing Agamemnon, it is not fabulating: Achilles' right brain hallucinated the voice of the Goddess and restrained him. In Jaynes' view, there is a large amount of varied literary, anthropological, and neurological evidence supporting this admittedly bizarre hypothesis. For example, he compares the language used in the Biblical Book of Amos (bicameral) with that in Ecclesiastes (conscious). He finds many examples of records from the right period of history bewailing the loss of the guidance of the gods, the stilling of their voices, and the measures that people took, involving seers and prophets, to try to bring the guiding voices back. Jaynes speculates that mental states such as schizophrenia, which are frequently accompanied by irresistible auditorily hallucinated commands, may be throwbacks to the older, "bicameral" mental state. Whether you find the theory amazingly brilliant or amazingly stupid, I urge to to withhold judgment until you have read the book. It is a fat book, and there is a mass of fascinating detail. As I implied, it's either a work of profound genius or of profound crackpottery, and I'm not sure which. (Yaakov Sloman tells me that the response to Wittgenstein's Tractatus Logico-Philosophicus was similarly ambivalent when it was new. I think the consensus is now on the genius side.) Either way, it is quite fascinating. There needs to be some theory to account for the historical development of consciousness, and as far as I know, this is the only one on offer. Anyway, I did not mean to get into this in so much detail. The reason I brought this up is that because of my continuing interest in Jaynes' theory, and how it is viewed by later scholars, I am reading Muses, Madmen, and Prophets: Rethinking the History, Science, and Meaning of Auditory Hallucination by Daniel B. Smith. I am not very far into it yet, but Smith has many interesting things to say about auditory hallucinations, their relationship to obsessive-compulsive disorder, and other matters. On page 37 Smith mentions a paper, which as he says, has a wonderful title: "Involuntary Masturbation as a Manifestation of Stroke-Related Alien Hand Syndrome". Isn't that just awesome? It gets you coming and going, like a one-two punch. First there's the involuntary masturbation, and while you're still reeling from that it follows up with "alien hand syndrome". To save you the trouble of reading the paper, I will summarize. The patient is a 72-year-old male. He has lesions in his right frontal lobe. He is experiencing "alien hand syndrome", where his hand seems to be under someone else's control, grabbing objects, like the TV remote control, or grabbing pieces of chicken off his plate and feeding them to him, when what he wanted to do was feed himself with the fork in his right hand. "During his hospital stay, the patient expressed frustration and dismay when he realized that he was masturbating publicly and with his inability to voluntarily release his grasp of objects in the left hand." Reaction time tests of his hands revealed that when the left hand was under his conscious control, it suffered from a reaction time delay, but when it was under the alien's control, it didn't. People have occasionally asked me whether I dreamt in color or on black-and-white, by which I suppose they meant grayscale. This question was strange to me the first time I heard it, because up to then it had not occurred to me that anyone did not dream in color. I still find it strange, and I had to do a Google search to verify that there really are people who claim not to dream in color. One time, when I replied that I did dream in color, my interlocutor asked me if I was sure: perhaps I dreamt in black and white, but only remembered it as being in color later. I am sure I dream in color, because on more than one occasion I have had discussions in dreams about colors of objects. I can't remember any examples right now, but it was something like this: "Give me the red apple." "Okay, here." "That is not the red apple, that is the green apple!" And then I looked and saw that the apple I had thought was red was really green. One could still argue that I wasn't really dreaming in color, that it only seemed like that, or something. It's a delicate philosophical point. One could also argue that I didn't have any dream at all, I only thought I did after I woke up. I suppose the only refutations of such an argument either appeal to neurology or involve a swift kick in the pants. And then suppose I have a dream in which I take LSD and have marvelous hallucinations. Did I really have hallucinations? Or did I only dream them? If I dream that I kill someone, we agree that it wasn't real, that a dream murder is not a real murder; it is only in your head. But hallucinations, by definition, are only in your head even when they are real, so don't dream hallucinations have as much claim to reality as waking hallucinations? One might argue that dreamt LSD hallucinations are likely to be qualitatively very different from real LSD hallucinations—less like real LSD hallucinations, say, and more like, well, dreams. But this only refutes the claim that the dream hallucinations were LSD hallucinations. And nobody was going to claim that they were LSD hallucinations anyway, since no actual LSD was involved. So this doesn't address the right question. Stickier versions of the same problem are possible. For example, suppose I give Bill a little piece of paper and tell him it is impregnated with LSD. It is not, but because of the placebo effect, Bill believes himself to be having an LSD trip and reports hallucinations. There was no LSD involved, so the hallucinations were only imaginary. But even real hallucinations are only imaginary. Are we really justified in saying that Bill is mistaken, that he did not actually hallucinate, but only imagined that he did? That seems like a very difficult position to defend. I seem to have wandered from the main point, which is that I had another dream last night that supports my contention that I dream in color. I was showing my friend Peter some little homunculi that had been made long ago from colored pipe cleaners, shiny paper, and sequins by my grandmother's friend Kay Seiler. Originally there had been ten of these, but in the dream I had only five. When my grandmother had died, my sister and I had split the set, taking five each. In place of the five originals I was missing, I had five copies, which were identifiable as such because they were in grayscale. Presumably my sister had grayscale copies of the originals I retained. I explained this to Peter, drawing his attention to the five full-color homunculi and the five grayscale ones. So yes, barring philosophical arguments that I think deserve a kick in the pants, I am sure that I dream in color.